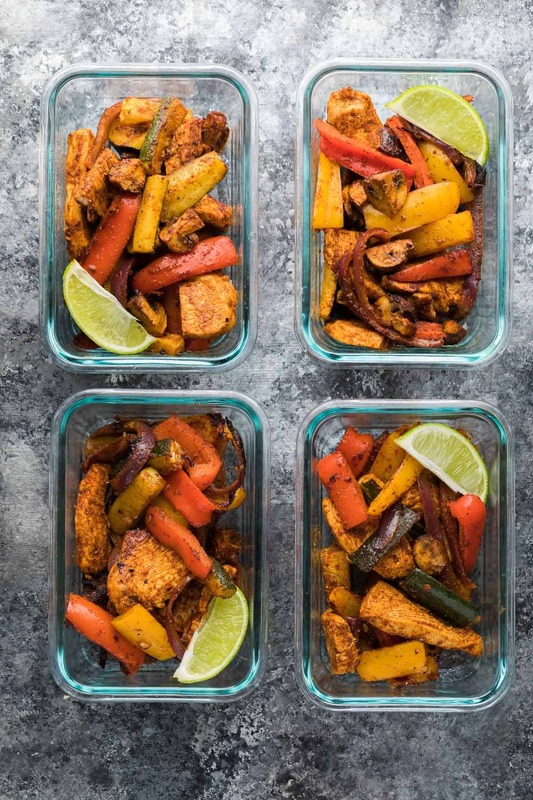 These meal prep chicken fajitas are made on one (or two) sheet pans, making for a super easy prep and even easier clean up! Serve them in tortilla bowls for a no-mess lunch. It feels like things are finally happening! After three months of de-cluttering, organizing, cleaning, and just plain packing up boxes and putting stuff into storage, our house is *almost* ready to put on the market. I’m half excited and half dreading it, since we might not really be able to use the kitchen (boo…no recipe testing for me) or make any messes. And we’ll probably be hanging out at the mall/park/frozen yogurt place while the house shows. We are so ready to get this house sold and then we can cross that off the list…only 2 more months until we are moving to our dream house! I can’t wait to share some photos of it with you. While I’m buzzing with excitement to get this house on the market, I’m also buzzing with excitement over our latest Lunch Prep Challenge! And these meal prep chicken fajitas were our very first recipe in the challenge this time. They are just so simple! 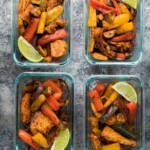 These meal prep chicken fajitas include my favorite Homemade Fajita Seasoning recipe that you rub all over the veggies and chicken with some olive oil and lime juice, then spread out on a sheet pan and roast until cooked through. That’s it. Seriously. No rice, no vinaigrette or sauce or anything else. 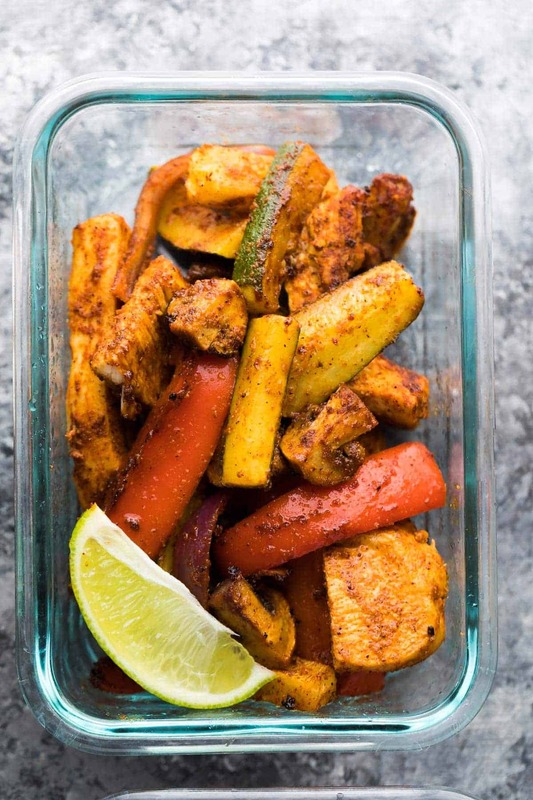 Just your roasted veggies and your chicken, in a container, which you then serve in tortillas, or as I recommend, tortilla bowls! I am just in love with the tortilla bowls you can find these days, which make eating your fajitas so much cleaner than a normal tortilla. We enjoyed ours with some greek yogurt, salsa, and guacamole. So simple and so tasty! Come to think of it, meal prep recipes are probably going to be our best friend once our house is on the market and we have to keep a clean kitchen. I definitely foresee these meal prep chicken fajitas on the menu again soon! Toss the chicken and veggies in a large bowl with the olive oil and lime juice. Add the rub in 2-3 batches and stir to coat. 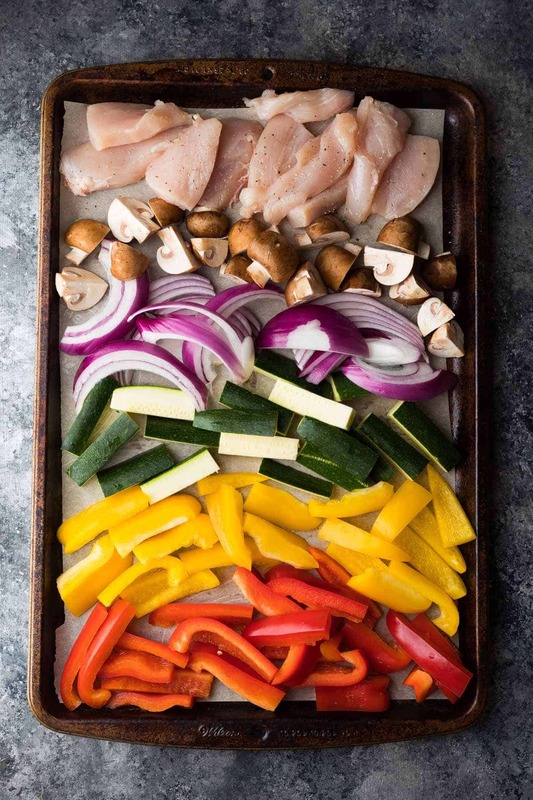 Arrange chicken and veggies on two large sheet pans. Roast for 10 minutes, flip and roast for another 5-10 minutes, or until chicken is cooked through. Cool and divide into 4 2-cup capacity storage containers. Storage:Store in the fridge for up to 4 days. 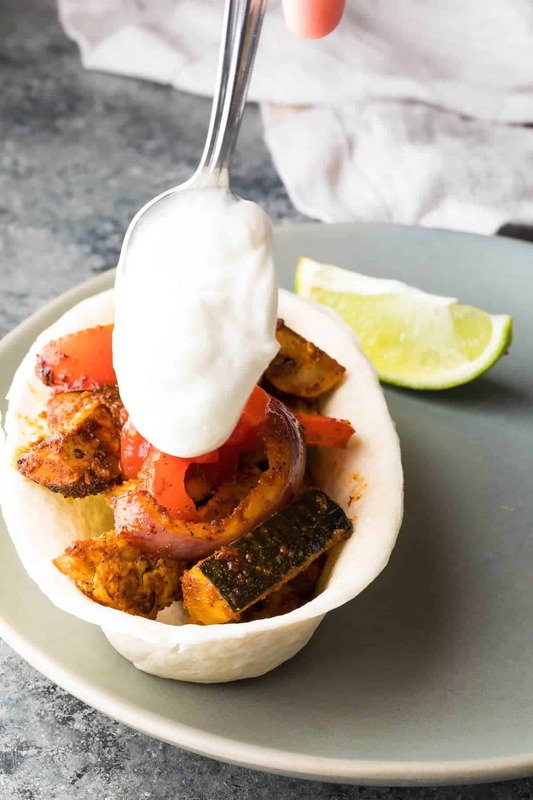 To serve:Heat filling in the microwave, then spoon into tortilla bowls or regular tortillas and top with salsa and/or yogurt. 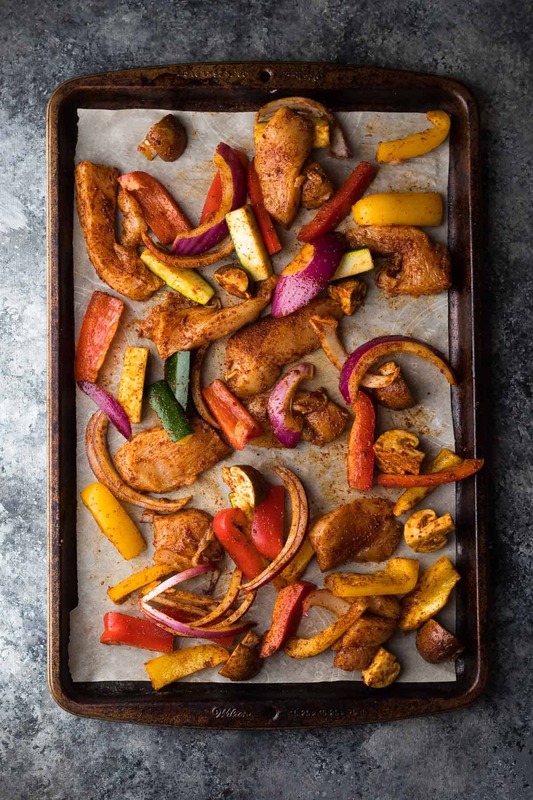 I love the idea of sheet pan meals, and personally love southwestern seasonings. However, hubby isn’t a fan. Can a similar thing be done with other seasonings, like Italian or Greek? Thanks. 14 fat grams per serving….how can we make this less fattening? I just re-ran it through My Fitness Pal and the fat comes from the olive oil, the tortillas and the chicken breasts. If you wanted to lower the fat you could serve over cauliflower rice instead, or enjoy as a salad type of meal. Have you included tortillas in the nutritional info? this looks very yummy! can you please clarify how many cups of the veggies need to add? Hi Leilee, Sorry about that, it should say 4-6 cups of veggies. This dish seems so easy, healthy and palatable! I will have to give it a try!